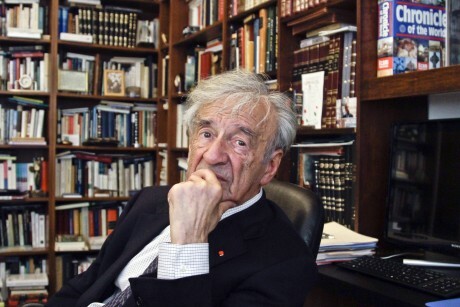 Elie Wiesel photographed in his New York Office on Sept. 12, 2012, by AP photographer Bebeto Matthews. Notice how well covered his left arm is … how does he ” pull back his left jacket sleeve” to reveal his tattoo to reporter Verena Dobnik? Telephone calls to the New York office of the Associated Press (212-621-1500), where Dobnik is assigned, along with two emails to the address the AP gives out for “feedback and comments” ([email protected]), which they say they welcome, have not been answered. A pleasant young man in the Dallas office of the AP, whom I talked to some days ago, assured me that comments about stories are relayed to the reporter who wrote them. I believe that is probably true so I put the fault on Verena Dobnik. I just now called and reached another voice mail at the New York office, but this time it belongs to a man in the communications department, so perhaps I will hear back from him. “Usually I don’t show it,” he says. We are not told what Dobnik actually saw. Does she know what a “Nazi death camp number” looks like? This is too vague a “description” for a professional reporter to use. Elie Wiesel has NEVER shown a tattoo on his arm to any camera, even though there is a long history of questions stating doubts that he actually has one and challenging him to show it to the public. A cameraman (Bebeto Matthews) may have accompanied Ms. Dobnik on that occasion to Wiesel’s NY office and took some photos – Wiesel is seen wearing a heavy suit and long sleeved dress shirt in photos taken on Sept. 12, making it hardly possible for him to just “pull back his sleeve” to reveal a tattoo on his forearm. He would have had to unbutton his shirt cuff and roll it back, an unlikely gesture as Wiesel is not known to have done it for any other reporter. Without a corroborating witness or a photo taken of Wiesel actually baring his arm with a tattoo present on it, there is no reason to believe the reporter’s casual interjection of this event. Further, because of the controversy about Elie Wiesel’s “tattoo” it is natural to suspect this was added by Dobnik to her article to try to give some credence to Wiesel’s claim that he has a tattoo even though no one has ever seen it. The Associated Press is thus being USED by Dobnik to disseminate lies in order to further what is false propaganda about “the Holocaust” in general and Elie Wiesel in particular. The Associated Press needs to take this very seriously by questioning Verena Dobnik about this interview. This is equally questionable. In the first place, it is very vague – it actually makes no sense, but the reader is left with the impression that Wiesel told Dobnik that he showed his tattoo to these two world leaders at that time. However, there is NO statement from Wiesel himself that he showed a tattoo to Obama and Merkel in 2009 at Buchenwald. Also none from Obama or Merkel. This absolutely smacks of fabrication on the part of the reporter to make her interview more interesting, and maybe more important and noticeable. However, NO OTHER PUBLICATIONS or writers picked up on this astounding news that Wiesel had made this gesture to two world leaders at Buchenwald! Why not? Because it is not corroborated and no doubt could not be corroborated. Also, Dobnik is stating falsely that Buchenwald was a “death camp.” It has been admitted for many years by official Holocaust historiography that Buchenwald was not a so-called death camp, and that there were no “death camps” in Germany. According to the official version of the Holocaust, there were only five “extermination camps,” all in Poland. Verena Dobnik is guilty of (1) interjecting false propaganda into her reports for the purpose of misinforming and inciting hatred against Germany in the minds of her readers. If she is ignorant about the facts of the Holocaust, the editors at the Associated Press should not be. But worse, she is guilty of (2) LYING about what took place during her interview with Elie Wiesel. I am serious as a heart-attack about this blatant case of journalistic fraud carried out under the nose of the Associated Press, and approved by you. I demand that you reply to this email within a few days time and give me whatever explanation you have. If you find that my complaint has legs, you need to issue a public retraction and an apology. I intend to pursue this issue vigorously. great job, CY, keep after them, if you need others to write in too, let us know. I already let people know I wanted them to write in, in the preceding article!! I gave out all the information needed to write or call. I even went on the Rick Adams show on RBN last Wednesday and plugged the whole idea, but I don’t think anybody has done anything. At least, they haven’t told me so. I’ve only gotten a few emails from folks saying things I already know and don’t need to hear, but not a one said, “I sent an email to the AP like you asked.” That’s why we don’t get anywhere. :-( It actually takes hundreds of people writing to [email protected]. Then we would see some action. But even 10 would make an impression. Update from yesterday: Today I called the AP New York office again and what sounded like the same man answered. I gave him my name and told him I had called yesterday and he connected me to a “communications” department where I had to leave a voice mail message, but was not contacted. I could tell he remembered me and appeared to have “instructions” this time, relaying me to the director of Media Relations. But again, I had to leave a voice mail message because this man said he is in and out on this day before Thanksgiving. I was given another number to call if it was important to reach someone right away, which I did call, and again had to leave a message for “Erin” who said she would call back as soon as she could. That’s where it stands now, but the whole place is aware of me now and it would be really helpful if a bunch of you would call 212-621-1500 on Friday, Saturday, Monday, etc. Tell them that you don’t believe Verena Dobnik’s claim that she saw Elie Wiesel’s tattoo and want (expect, demand) that they verify it. I think we can put their feet to the fire. This is the best opportunity to put out the message that they can’t get away with this! I sent them an email this evening, and I will continue to do so until I get a response. I cannot afford to make international calls from the UK, unfortunately, so email will have to suffice. Hey Roger, thanks so much! Email is fine. I’m sure some others are doing it too but don’t want to be mentioned … that is understandable. Unfortunately, my ewtattoo email account is down right now so I can’t access any incoming mail. I have no idea when that will be fixed, but I have reported it. I will be addressing this issue of the AP on my Monday, Nov. 26th Heretics’ Hour program. Latest update: I called the AP again this morning and was connected to the Communications department. I had to insist to the woman that I was very serious and expected a reply from AP and/or Verena Dobnik. She finally asked me to resend my last email (since I have written two) and she would look out for it and address it. I decided, after reading it, to resend my first email, which I just did. Now, it is important for the readers of this blog to also send emails to [email protected] strongly questioning the truthfulness of Verena Dobnik’s claim that Elie Wiesel showed her a tattoo on his left arm by “pulling back his jacket sleeve.” Be sure to say you expect more proof than just some reporter saying so! Also, put ‘Verena Dobnik lies about Elie Wiesel Tattoo? – Oct. 8 AP story’ in the subject line (or something similar) to be sure it is noticed and read. Additionally, phone calls should be made if at all possible – 1-212-621-1500. State your name and say very clearly what you are calling about and that you would like to speak to someone with authority. Tune in to tonight’s Heretics’ Hour at 9pm Eastern at http://thewhitenetwork.com. Listen live by clicking on the mp3 stream at the upper right of the page. Thanks so much, Brian. No one has gotten back to me either, but I’m working on a new blogpost. My teacher has met Elie and he said that he doesn’t show the tattoo because he thinks of it as another victory for the Nazis. He doesn’t want to parade around his tattoo saying “Oh, look what they did to me.” For that reason he does not show his tattoo. Do you really think he could make all this up? There are pictures of him in Auschwitz, he was taken to Birkenau, and Buna. He is no fraud. He is a witness, whose story needs to be told. Laura … your teacher, huh? And just who is your teacher? Maybe your teacher should write in himself. Do I really think he (Elie) could make all this up? YES. Hundreds of others have, why not him? There are NO PICTURES OF HIM IN AUSCHWITZ or Birkenau or Buna; where did you get that idea? If you think so, please send it to me. There aren’t even any records for him there. There are no pictures of him at Buchenwald either, contrary to what people believe, and also no credible records. I have proven beyond a shadow of a doubt on this website that it is not Elie Wiesel in the famous Buchenwald liberation photograph. Since he says to the world that it is, knowing that it isn’t, makes him a really horrible fraud. You should get honest about all this — read this site and learn something. What nonsense! He has made a name for himself by telling people “what they did” to him. He is a professional sensationalist, and he has been doing this for more than half a century. He is willing to put in the effort to write book length accounts of “what they did” to him, and to travel across the world propagating his stories about the concentration camps, but he does not want to roll up his sleeve and display his tattoo? Remarkable. If he wants to keep his supposed experiences private, he would not write books like “Night”. So very true, Roger. I talked to “Lauren” in Corporate Communications just now and found that NO ONE wants to speak to me. She wouldn’t even give me her last name. They are very secretive at the Associated Press … you would think they were part of the NSA or something! :-) I will write more on this in a blog during the week. But friends, keep calling and sending those emails !